I’m going to tell you the single BEST life choice you (or anyone) could possibly make. But before I get to that, let me tell you a quick story. I’m Indian. So I’m genetically predisposed to be a doctor. So naturally, back when I first started out in college, I was pre-med. As were a bunch of my friends. 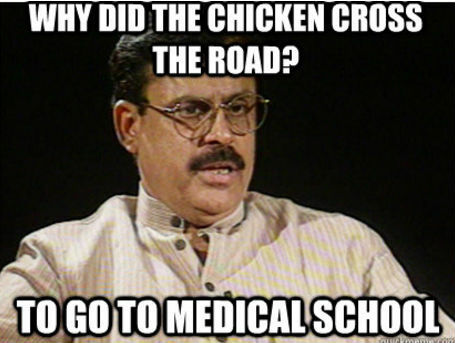 Everyone thinks being a doctor is difficult. But in reality, it’s super simple! You know exactly what classes to take, what grades to get, what tests to take, and what your scores should be – once you get into medical school, you’re pretty much guaranteed a job afterwards at a decent salary. The whole career path is straightforward, and there’s TONS of test prep resources and other stuff to help along the way. We KNEW we weren’t excited about it. But we also knew exactly what we were getting into. So it was hard to switch. What if we switched into the wrong field, and wasted YEARS doing something we didn’t like? What if what we THOUGHT was our “dream job” turns out to be boring? What if we get “locked out” of our comfort zone forever? A lot of people struggle with similar questions. Who wants to leave an okay job for something that MIGHT be amazing, but also might mess up their entire life? People hate being disappointed. Most of us would rather stay in a job we KNOW doesn’t excite us, instead of finding a new job that MIGHT not excite us. So we continue to “keep our options open” and “not close any doors” because we’re afraid of making the wrong choice. But practically everything we enjoy comes from DECREASING our options. Settling down with ONE person. Getting really good at ONE thing. Building a deep relationship with ONE team. Auren Hoffman said it best, the single best life choice you could make is actually LIMITING your options. That means picking ONE field that you really enjoy. But how do you figure out which field to pick?! But that’s not realistic. You can’t pretend like you have nothing to lose when you ACTUALLY DO have something to lose if you make the wrong decision. But the truth is, you don’t have to take a risk at all. In fact, with the right approach, you can narrow your interests, choose the right path and practically GUARANTEE that it’s going to work out. In Silicon Valley, it’s way too common for engineers to lock themselves in their office, build a product they think is awesome, and release it months or even years later. But when they do, nobody uses it! They never validated their ideas. They never talked to the market first. Finding the perfect job is very similar. You can’t “figure it out” on your own. You need to talk to people who actually have the jobs you think you want. You need to validate your interests. Here’s the step by step process I used to narrow down my interests, and figure out exactly what I wanted to do. I listed practically every field that seemed even remotely interesting. Some of fields I was considering were data science, business development, design, and marketing. I felt like I had a lot of little things I was good at – like being creative, doing research, writing, analyzing things, and a bunch of other stuff. But how did ANY of that translate to a real job? I had no idea. So I was all over the place. But that’s ok. Start off as broad as you can. You can narrow it down later. For example, an actual job in design would be “UX designer”, “Product Designer”, etc. In business development, it could be “account executive”, “inside sales”, or whatever. In marketing, some interesting ones to me were “growth hacker”, “content marketer”, “product marketer”, etc. If you absolutely KNOW there are some specific positions you’d hate within these fields, then X them off the list. But it’s ok to start off with a bunch of options that seem kinda interesting. By talking to people who are already down the path you’re considering taking, you can get a pretty good look at what your future might be like. LinkedIn is a good tool for finding these people. 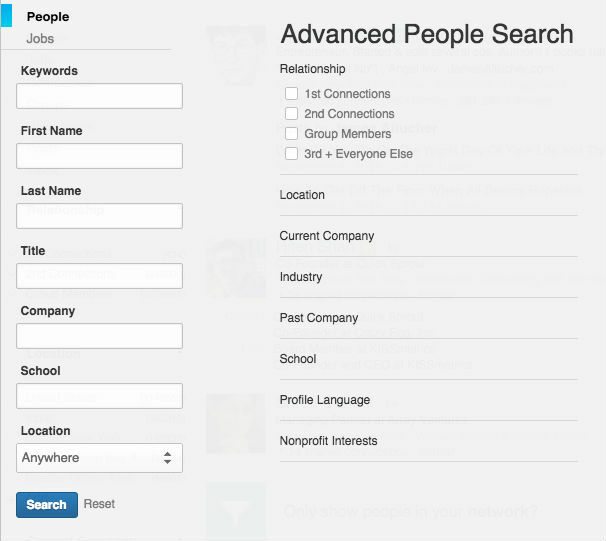 Using the “advanced search” feature, you can find people who have the job titles you listed in the previous step. But in reality, people LOVE to help. Everyone wants to give advice. Everyone wants to be seen as an “expert” by someone else. Most people would love to talk to you if you’re interested in what they’re doing, and if you’re thinking about doing the same thing. Make a special note of your University alumni, and people you have a mutual connection with (you can filter for these people specifically in the LinkedIn search). These are the people who would be most likely to talk to you. a couple of times I was available to talk while also mentioning that I’d be totally flexible to their schedule if need be. If you ask the right questions, you can understand exactly what you’d do day to day on the job, what sorts of options would still be open to you if you went down that route, how excited they are about the job, and more. Basically you want to do your research on the person’s background, and come up with questions that 1) show that you’ve done your research, and 2) allow you to get a glimpse into their life. If you lived their day to day life at work, would you like it? These are just example questions. You can switch them out with what YOU want to learn. And make it conversational. After you talk to a few people in each job you’re interested in, you’ll know what to expect. You’ll know what options would still be open if you took up that job, you’ll know how fun the job is, and you’ll know if it “clicks” with you. And most importantly – you won’t waste ANY time going down the wrong path.